The latest photo, shared Wednesday afternoon by Techtastic.nl, is very similar to alleged "iPhone 7 Plus" technical specifications that were revealed earlier in the day. 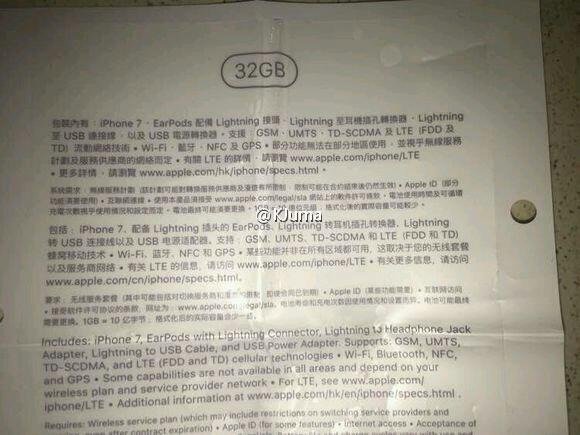 But the latest photos are for a "iPhone 7" model with 32 gigabytes of storage. 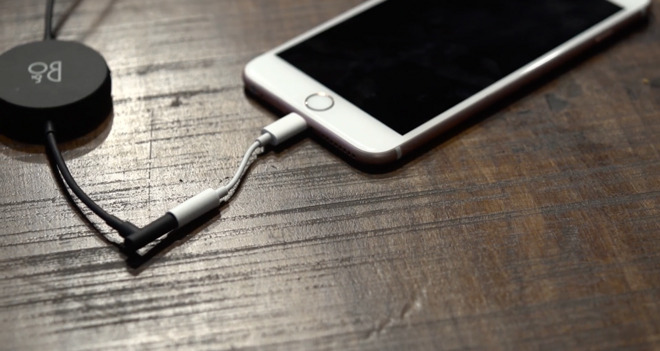 Both the 32-gigabyte "iPhone 7" sheet and the 256-gigabyte "iPhone 7 Plus" sheet both make mention of an Apple-branded Lightning to Headphone Jack Adapter included in the box. Both handsets are also advertised to ship with new EarPods sporting a Lightning Connector. Certain parts of the packaging insert are suspect, such as the fact that it appears to be stuck to another piece of paper with holes punched in it. But the content matches the separate leak from earlier Wednesday, potentially supporting its legitimacy. As for the 32-gigabyte capacity, it's heavily rumored that the size will become the new entry level for this year's iPhone upgrade. That would double the 16-gigabyte minimum capacity found in the current generation iPhone 6s, and go a long way toward quashing user complaints about the amount of space needed to install iOS updates. In addition to new capacities of 32 and 256 gigabytes, the "iPhone 7" is also expected to ditch the legacy 3.5-millimeter headphone jack, pushing users toward Lightning-connected headphones, as well as wireless Bluetooth headsets. The inclusion of an adapter for traditional headphones in the box could help soften public outcry against the elimination of the ubiquitous headphone plug. As for why Apple is apparently eliminating the headphone jack this year, the expectation its removal will allow for thinner designs, and also allow for the "iPhone 7" to be the most water resistant handset Apple has ever built. Combined with a new capacitive home button featuring haptic feedback in place of a physical click, Apple could also free up valuable real estate within the iPhone's chassis, enabling improvements to design or the luxury of fitting larger battery cells. Apple is expected to take the wraps off of the "iPhone 7" series at a keynote presentation next Wednesday in San Francisco. AppleInsider will be there live with full coverage of the event.